The innate immune system has been implicated in both AKI and CKD. Damaged mitochondria release danger molecules, such as reactive oxygen species, DNA, and cardiolipin, which can cause NLRP3 inflammasome activation and upregulation of IL-18 and IL-1β. It is not known if mitochondrial damage persists long after ischemia to sustain chronic inflammasome activation. We conducted a 9-month study in Sprague–Dawley rats after 45 minutes of bilateral renal ischemia. We detected glomerular and peritubular capillary rarefaction, macrophage infiltration, and fibrosis at 1 month. 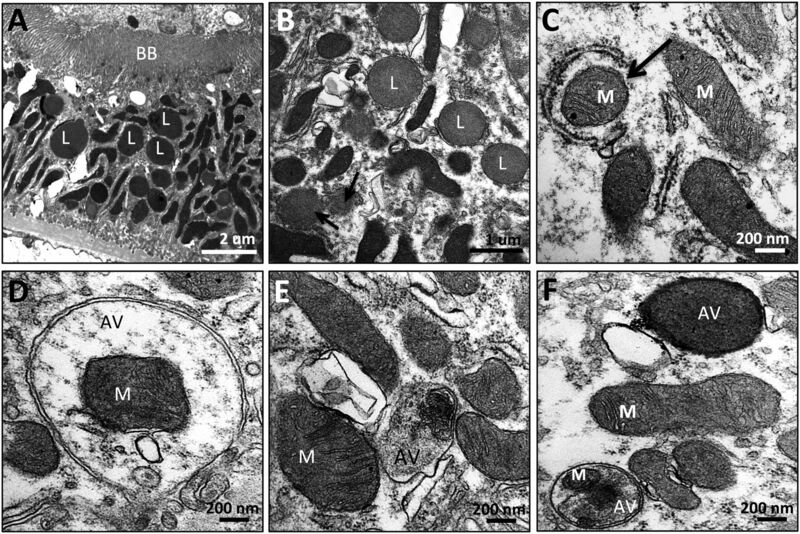 Transmission electron microscopy revealed mitochondrial degeneration, mitophagy, and deformed foot processes in podocytes. These changes progressed over the study period, with a persistent increase in renal cortical expression of IL-18, IL-1β, and TGF-β, despite a gradual decline in TNF-α expression and macrophage infiltration. Treatment with a mitoprotective agent (SS-31; elamipretide) for 6 weeks, starting 1 month after ischemia, preserved mitochondrial integrity, ameliorated expression levels of all inflammatory markers, restored glomerular capillaries and podocyte structure, and arrested glomerulosclerosis and interstitial fibrosis. Further, helium ion microscopy vividly demonstrated the restoration of podocyte structure by SS-31. The protection by SS-31 was sustained for ≥6 months after treatment ended, with normalization of IL-18 and IL-1β expression. 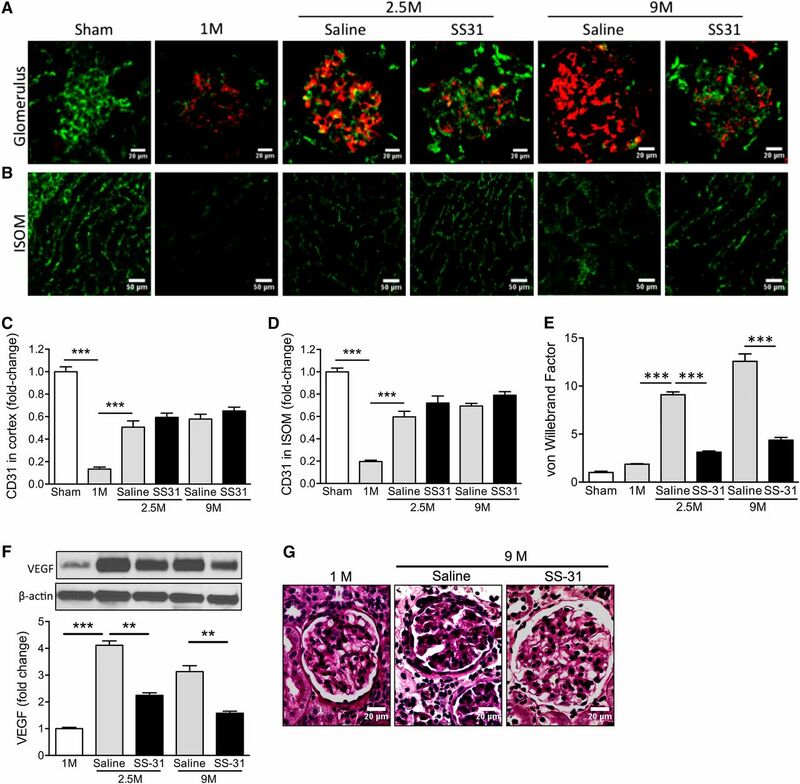 These results support a role for mitochondrial damage in inflammasome activation and CKD and suggest mitochondrial protection as a novel therapeutic approach that can arrest the progression of CKD. Notably, SS-31 is effective when given long after AKI and provides persistent protection after termination of drug treatment. Inflammation plays a critical role in the initiation and progression of renal fibrosis.8 Injured epithelial cells secrete proinflammatory cytokines to recruit inflammatory cells to sites of injury to drive tissue repair. Profibrotic cytokines, such as TGF-β, stimulate matrix-producing cells to produce extracellular matrix. Antifibrotic treatments have mostly targeted TGF-β, but TGF-β is a pleiotropic cytokine with vital anti-inflammatory functions, and blocking TGF-β activity may incite immune activation.10 It is thus imperative that novel targets be identified that can arrest the chronic inflammation and progressive fibrosis. Inflammasome activation in response to a variety of stimuli appears to converge upon mitochondrial reactive oxygen species (ROS).17–19 Mitochondrial DNA and N-formyl peptides represent two other sources of mitochondrial DAMPs.20 Compounds that cause mitochondrial damage enhance NRLP3 activation, whereas compounds that reduce mitochondrial ROS inhibit inflammasome activation.21–23 Further, NLRP3 appears to bind directly to cardiolipin, a phospholipid that is only expressed on the inner mitochondrial membrane, suggesting that mitochondrial damage and the translocation of cardiolipin to the outer mitochondrial membrane (OMM) may provide the docking signal for inflammasome assembly and activation.24 Ischemia causes mitochondrial injury,25 but it is not known if mitochondrial damage persists long after ischemia to account for sustained inflammasome activation. SS-31 (also known as elamipretide) is a synthetic tetrapeptide (D-Arg-2′6′-dimethylTyr-Lys-Phe-NH2) that selectively targets cardiolipin on the inner mitochondrial membrane to protect cristae curvature, stabilizes mitochondrial structure, facilitates electron transport, and minimizes ROS production.26–28 SS-31 is very effective in minimizing ischemic AKI and preventing the development of interstitial fibrosis and glomerulosclerosis.25,29 It is not known if later administration of SS-31 can stop the progression of CKD. We conducted a 9-month study in rats subjected to bilateral renal ischemia. Significant mitochondrial damage was found in endothelial cells, podocytes, and proximal tubular cells 9 months after ischemia. Treatment with SS-31, starting 1 month after ischemia and maintained for 6 weeks, protected mitochondrial integrity and halted the progression of glomerulosclerosis and tubulointerstitial fibrosis. The protection by SS-31 was sustained for at least 6 months after treatment ended. 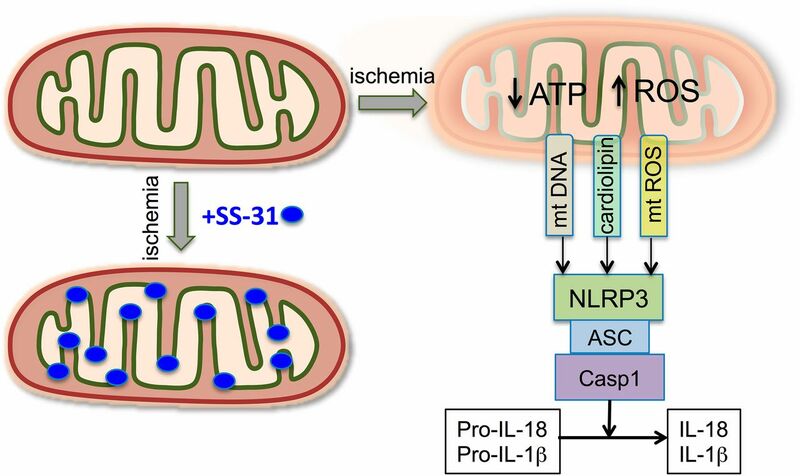 Upregulation of IL-1β and IL-18 at 9 months after ischemia was normalized by SS-31 treatment, suggesting that SS-31 reduced CKD by protecting mitochondria and preventing inflammasome activation. Adult rats (n=53) were subjected to bilateral renal ischemia for 45 minutes and then allowed to recover for 4 weeks. Mortality was approximately 30% with 45 minutes ischemia, but normal renal function was fully restored after 4 weeks.29 Surviving animals (n=37) were randomly assigned to treatment with saline or SS-31 (2 mg/kg per day) for 1.5 months via a subcutaneously implanted osmotic pump (see Table 1). We previously reported that this duration of ischemia results in tubular necrosis and significant increase in serum creatinine, BUN, and fractional excretion of Na+ and K+.25 Although full recovery of renal function is achieved <1 week after ischemia, interstitial fibrosis is seen in the outer medulla 1 month later.29 In this study, we found progressive increase in interstitial fibrosis and glomerulosclerosis through 9 months after ischemia (Figure 1, A–D) that were associated with continuing increase in TGF-β expression in renal cortical tissue (Figure 1E). Six weeks of treatment with SS-31, starting 1 month after ischemia, significantly blunted the upregulation of TGF-β (Figure 1E, Supplemental Figure 1) and halted the progression of interstitial fibrosis and glomerulosclerosis (Figure 1, A–D). This antifibrotic effect of SS-31 was sustained for >6 months after treatment (Figure 1, A–D). 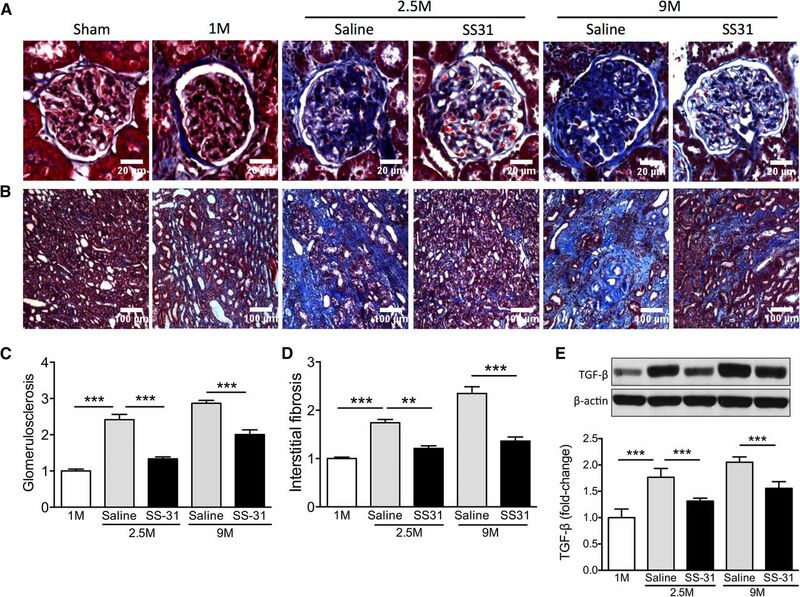 SS-31 halts progression of interstitial fibrosis and glomerulosclerosis after acute renal ischemia. Rats were treated with SS-31 (2 mg/kg per day) or saline for 1.5 months starting 1 month after acute ischemia. (A) Representative images of trichrome stain of the renal cortex showing progressive increase in glomerulosclerosis at 1 month (1M), 2.5 months (2.5M), and 9 months (9M) after acute ischemia. Treatment with SS-31 starting at 1M prevented progression of fibrosis at 2.5M, and protection was seen even 6 months after termination of treatment. (B) Representative images of trichrome stain of the inner stripe of the outer medulla (ISOM) showing prevention of fibrosis by SS-31 treatment. (C) Quantification of trichrome stain in glomeruli at various times after ischemia. Data shown as mean±SEM; n=4/group; ***P<0.001. (D) Quantification of trichrome stain in ISOM at various times after ischemia. Data shown as mean±SEM; n=4/group; **P<0.01; ***P<0.001. (E) Representative Western blot and densitometric analysis of TGF-β expression in renal cortical tissue. Data shown as mean±SEM; n=4/group; ***P<0.001. (See Supplemental Figure 1 for all Western blots). We previously reported >15-fold increase in TNF-α and interstitial infiltration of lymphocytes and macrophages 1 month after acute ischemic injury.29 Here we report further increase in TNF-α expression in renal cortical tissue and glomerular infiltration of CD68+ macrophages 2.5 months after acute ischemia (Figure 2, A and B, Supplemental Figure 1). This inflammatory response remained high but began to decline by 9 months. SS-31 significantly reduced TNF-α expression and macrophage infiltration at 2.5 months, and this effect was sustained for >6 months after termination of treatment. 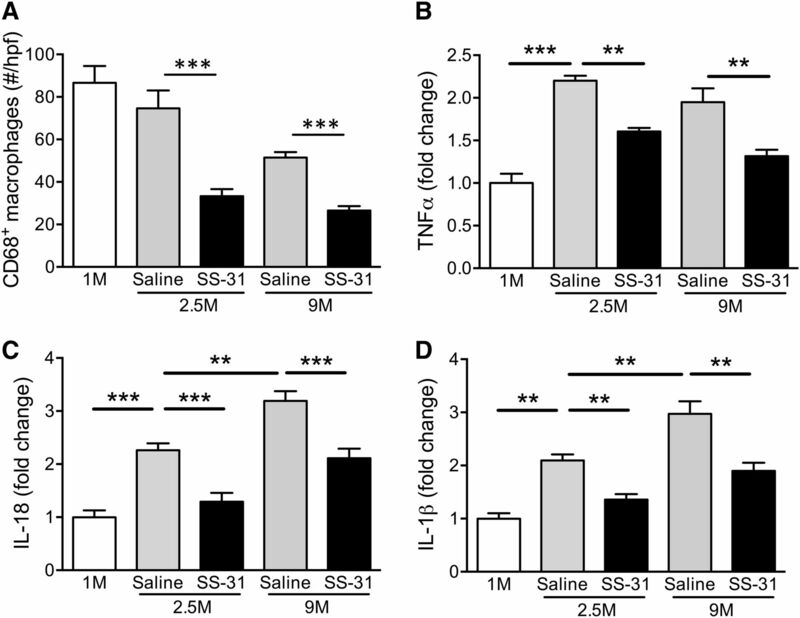 SS-31 reduces inflammation after acute renal ischemia. Rats were treated with SS-31 (2 mg/kg per day) or saline for 1.5 months starting 1 month after acute ischemia. 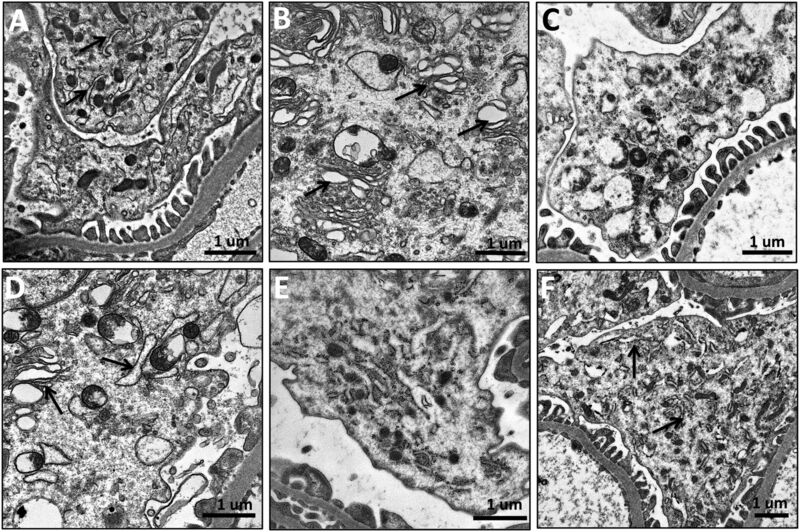 (A) The number of CD68+ macrophages per glomerulus at various times after ischemia. The number shown reflects the average determined from ten glomeruli per sample and averaged. Data shown as mean±SEM; n=4/group; ***P<0.001. (B) Representative Western blot and densitometric analysis of TNF-α expression in renal cortical tissue at various times after acute ischemia. Data shown as mean±SEM; n=4/group; **P<0.01; ***P<0.001. (C) Representative Western blot and densitometric analysis of IL-18 expression in renal cortical tissue at various times after acute ischemia. Data shown as mean±SEM; n=4/group; **P<0.01; ***P<0.001. (D) Representative Western blot and densitometric analysis of IL-1β expression in renal cortical tissue at various times after acute ischemia in saline and SS-31-treated rats, versus age-matched controls. Data shown as mean±SEM; n=4/group; **P<0.01. (See Supplemental Figure 1 for all Western blots). The eventual decline in TNF-α and macrophage infiltration led us to question if inflammasome activation plays a role in sustaining the continual upregulation of TGF-β. The expression of IL-18 and IL-1β continued to increase at 9 months after ischemia, but they were abolished by 6 weeks of SS-31 treatment (Figure 2, C and D, Supplemental Figure 1). Renal ischemia causes peritubular microvascular rarefaction that contributes to further tissue damage.29–31 There was significant loss of CD31 immunostaining in the renal cortex 1 month after ischemia, primarily in the glomeruli (Figure 3, A and C). There was also significant loss of CD31 in the inner stripe of the outer medulla (Figure 3, B and D). Despite partial recovery of CD31 expression in the renal cortex by 2.5 months, there was persistent upregulation of vascular endothelial growth factor even 9 months after ischemia (Figure 3E, Supplemental Figure 1), suggesting prolonged tissue hypoxia. The dramatic upregulation of vWF expression in post-ischemic glomeruli (Figure 3, A and F) indicates persistent endothelial injury after acute ischemia. vWF is a glycoprotein that mediates platelet adhesion to the subendothelium at sites of vascular injury, and it is normally not expressed in human glomeruli.32 We found no vWF expression in normal rat glomeruli, but vWF was clearly present in glomeruli at 1 month and progressively increased over 9 months after ischemia (Figure 3, A and F). Treatment with SS-31 did not improve CD31 expression (Figure 3, C and D), but significantly reduced vWF and vascular endothelial growth factor expression at 2.5 and 9 months, and the effect persisted for 6 months after treatment (Figure 3, E and F). Mesangial deposition of vWF is associated with mesangial matrix expansion and fibrin deposition,33 and periodic acid–Schiff staining showed that SS-31 prevented mesangial expansion at 9 months (Figure 3G). SS-31 reduces endothelial injury after acute ischemia. Rats were treated with SS-31 (2 mg/kg per day) or saline for 1.5 months starting 1 month after acute ischemia. (A) Representative microscopic images of glomeruli showing endothelial cell marker CD31 (green) and vWF (red) in saline- and SS-31-treated rats at 1 month (1M), 2.5 months (2.5M), and 9 months (9M) after ischemia. (B) Representative microscopic images of inner stripe of outer medulla (ISOM) showing CD31 (green) in saline and SS-31-treated rats at 1M, 2.5M, and 9M after ischemia. (C) Densitometric analysis of CD31 staining in renal cortex showing significant decrease in endothelial cell marker 1M after ischemia and partial recovery by 2.5M. SS-31 treatment had no effect on CD31 recovery. Data shown as mean±SEM; n=4/group; ***P<0.001. (D) Densitometric analysis of CD31 staining in ISOM showing significant decrease in endothelial cell marker 1M after ischemia and partial recovery by 2.5M. SS-31 treatment had no effect on CD31 recovery. Data shown as mean±SEM; n=4/group; ***P<0.001. (E) Representative Western blot and densitometric analysis of vascular endothelial growth factor (VEGF) expression in renal cortical tissue at various times after acute ischemia. Data shown as mean±SEM; n=4/group; **P<0.01; ***P<0.001. (See Supplemental Figure 1 for all Western blots). (F) Densitometric analysis of vWF stain in renal cortex showing marked increase in endothelial injury marker that was sustained over 9M after ischemia. SS-31 treatment abolished the increase. Data shown as mean±SEM; n=4/group; ***P<0.001. (G) Representative images of periodic acid–Schiff stain of glomeruli at 1M after ischemia, and at 9M in saline versus SS-31-treated rats. We used helium ion microscopy (HIM) to further investigate damage to glomerular capillaries and endothelial fenestrations after acute ischemia. HIM provides subnanometer resolution images of biologic tissues with greater detail than scanning electron microscopy.34,35 Figure 4A shows a representative cross-section of an age-matched (11 months) normal rat glomerulus with numerous capillary loops. In contrast, mesangial expansion and compressed capillary loops were observed 9 months after ischemia. SS-31 restored majority of capillary loops and reduced mesangial volume. Closer examination of the capillary endothelial surface shows uniform fenestrations in a normal glomerulus (Figure 4B). In contrast, there was loss of fenestrations and extensive adhesive material on the endothelial surface 9 months after ischemia. SS-31 restored normal fenestrations and reduced adhesive material, consistent with reduction of vWF expression. SS-31 reduces glomerular capillary compression and damage to endothelial fenestrations after acute ischemia. Rats were treated with SS-31 (2 mg/kg per day) or saline for 1.5 months starting 1 month after acute ischemia. Glomerular capillary structure was examined by HIM. 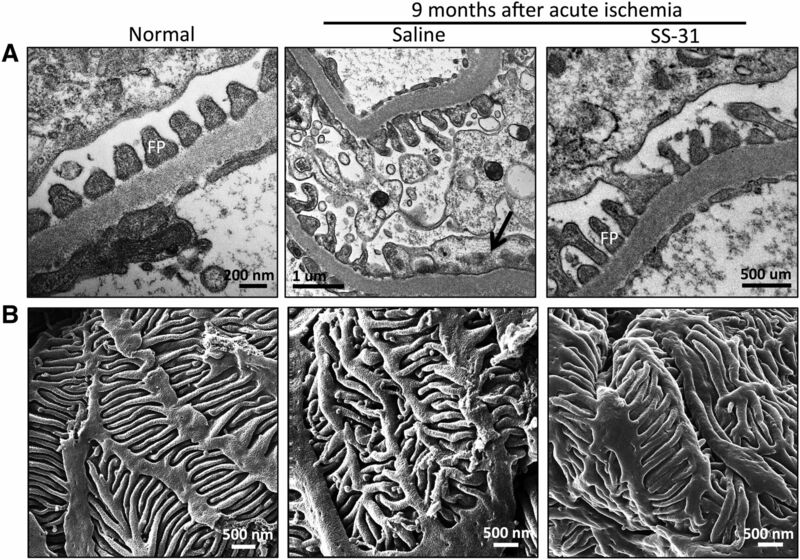 (A) Representative cross-sectional images of glomeruli at 9M after acute ischemia from saline and SS-31-treated rats, compared with age-matched normal rats. Ischemia caused capillary compression because of mesangial expansion (*) in saline-treated rats. Capillary loops are much more apparent in SS-31-treated rats and similar to image from normal rat. (B) Representative HIM images showing endothelial fenestrations from saline versus SS-31 rats compared with age-matched normal rats. Fenestrations are uniform in normal rats, whereas saline-treated rats show distorted fenestrations and adhesive material (white arrow). SS-31 treatment restored normal fenestration pattern. 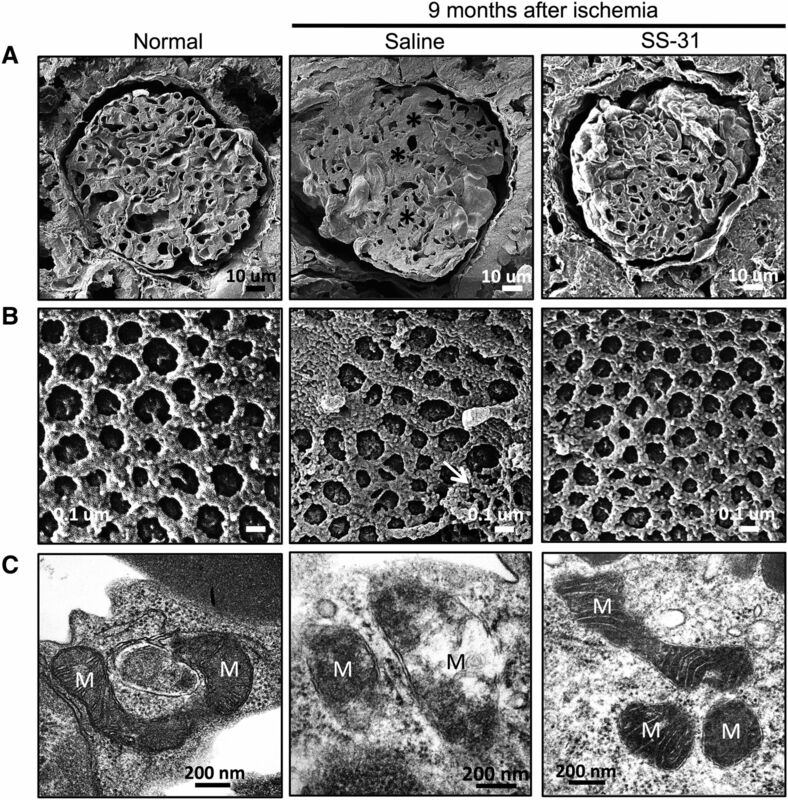 (C) Representative electron micrograph showing glomerular endothelial cell mitochondria from saline versus SS-31 rats at 2.5M after ischemia, compared with normal rat. Saline-treated ischemic cells show degenerative changes in mitochondria with disruption of cristae architecture, reduced matrix density, and some loss of OMM. SS-31 treatment restored normal endothelial mitochondria. (More examples are provided in Supplemental Figure 2). M, mitochondria. Ischemia causes extensive mitochondria damage in renal endothelial cells.29 Normal glomerular endothelial mitochondria are elongated, with dense cristae membranes and a dark matrix (Figure 4C, Supplemental Figure 2). Significant degenerative changes were still found in endothelial cells 2.5 months after ischemia, with loss of cristae membranes and matrix density, and evidence of rupture of the OMM. These degenerative changes were abolished by 6 weeks of treatment with SS-31. Podocytes are secretory cells that contain a well developed Golgi system, many mitochondria, prominent lysosomes, and abundant endoplasmic reticulum (ER) responsible for the folding and trafficking of proteins (Figure 5A).36 Transmission electron microscopy showed pronounced dilation of ER lumen, an indication of ER stress, in many podocytes 1 month after ischemia (Figure 5B) compared with sham rats (Figure 5A). By 2.5 months, the podocytes were highly vacuolated and there was a general loss of cytoplasmic density (Figure 5C). Podocyte stress was still apparent 9 months after ischemia (Figure 5D). However, 6 weeks of SS-31 restored normal ER structure (Figure 5E) and this persisted for at least 6 months after treatment (Figure 5F). SS-31 prevents podocyte stress after acute ischemia. Rats were treated with SS-31 (2 mg/kg per day) or saline for 1.5 months starting 1 month after acute ischemia. Podocyte structure was examined by transmission electron microscopy. (A) Representative image of a normal podocyte showing dense cytoplasm containing large number of endoplasmic reticulum (ER; arrows) and mitochondria. (B) Representative image obtained 1 month after ischemia showing pronounced dilation of ER (arrows). (C) Representative image obtained 2.5 months after ischemia showing loss of cytoplasmic density and large number of vacuoles. (D) Representative image obtained 9 months after ischemia with numerous dilated ER (arrows). (E) Representative image obtained 2.5 months after ischemia following short-term SS-31 treatment showing normal cytoplasmic structures. (F) Representative image obtained from an SS-31-treated rat 9 months after ischemia showing persistent podocyte protection with normal ER (arrows). Podocytes have a complex cellular architecture with interdigitating foot processes maintained by a precise organization of actin filaments in the cellular cytoplasm. Podocyte swelling and effacement of foot processes have been reported after 45 minutes of ischemia in rats, but little is known about long-term changes after acute ischemia.37 Transmission electron microscopy revealed swollen podocytes and foot process effacement 9 months after acute ischemia compared with age-matched controls (Figure 6A). Condensation of actin microfilaments can be seen in the flattened foot process. Short-term SS-31 treatment restored normal foot processes. HIM provided a much clearer image of the damage to podocytes (Figure 6B). In normal podocytes, the foot processes are long and tightly interdigitated to provide an effective filtration barrier. Ischemia resulted in shortened and deformed foot processes that did not interdigitate well. Podocyte foot processes were normalized with SS-31 treatment. SS-31 preserves podocyte foot processes after acute ischemia. Rats were treated with SS-31 (2 mg/kg per day) or saline for 1.5 months starting 1 month after acute ischemia. Podocyte structure was examined 9 months after ischemia. 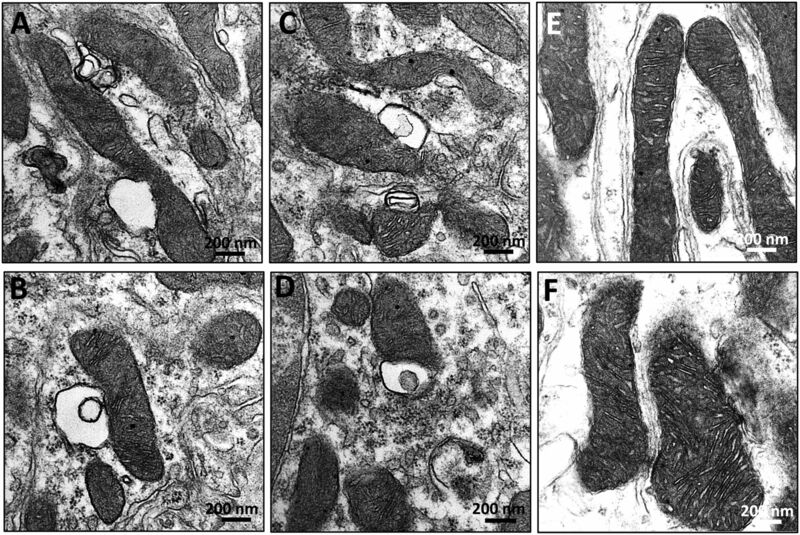 (A) Representative images of podocyte foot processes obtained by transmission electron microscope. Podocyte swelling and foot process effacement are common 9 months after acute ischemia compared with age-matched control. Condensation of actin microfilaments can be seen in the flattened foot processes (black arrow). Short-term SS-31 treatment restores normal foot processes. (B) Representative images of podocyte foot processes obtained by helium ion microscope. In normal podocytes, the foot processes are long and tightly interdigitated. Ischemia resulted in shortened and deformed foot processes. Short-term SS-31 treatment restores normal structural organization of foot processes. Mitochondria play a major role in providing ATP for maintaining the actin cytoskeleton in podocytes.38,39 The collapse of the podocyte actin cytoskeleton at 9 months suggests sustained mitochondrial damage after an acute event. Normal podocyte mitochondria are elongated with cristae membranes and a dark matrix (Figure 7A). One month after ischemia, mitochondria showed degenerative changes with loss of cristae membranes and matrix swelling (Figure 7B). These degenerative changes were extensive and persisted at 2.5 months, with some mitochondria showing destruction of the OMM (Figure 7C). At 9 months, most mitochondria were small with only remnants of cristae membranes and a clear matrix, whereas others underwent extensive proteolysis with just some residual matrix density (Figure 7, D–F). Six weeks of SS-31 treatment restored mitochondria structure (Figure 7G), and mitochondria remained normal even 9 months after ischemia (Figure 7H). SS-31 reverses ischemia-induced mitochondria damage in podocytes. Rats were treated with SS-31 (2 mg/kg per day) or saline for 1.5 months starting 1 month after acute ischemia. Podocyte mitochondria were examined 9 months after ischemia using transmission electron microscopy. (A) Representative image from normal podocyte showing elongated mitochondria with cristae membranes and a dark matrix. (B) Representative image obtained 1 month after ischemia showing mitochondria with degenerative changes including loss of cristae membranes and matrix swelling. (C) Representative image obtained 2.5 months after ischemia showing persistent mitochondrial damage. (D–F) Representative images obtained 9 months after ischemia. Many mitochondria are small with remnants of cristae membranes and a clear matrix, whereas others have undergone extensive proteolysis. (G) Representative image obtained from an SS-31-treated rat 2.5 months after ischemia showing normal mitochondria cristae and matrix density. (H) Representative image from an SS-31-treated rat 9 months after ischemia showing normal podocyte mitochondria. M, mitochondria. Persistent upregulation of autophagy in podocytes after acute ischemia. Rats were subjected to bilateral renal ischemia for 45 minutes and podocytes examined by transmission electron microscopy. (A) Autophagic vacuoles (arrows) containing organelles and cytoplasmic contents in podocytes 1 month after ischemia. (B) An intact mitochondrion can be seen inside an autophagosome. (C and D) Interaction between lysosomes (arrows) and mitochondria can be seen 9 months after ischemia. (E) Autophagolysosomes containing digested material and myelin bodies 9 months after ischemia. (F) Dilated endoplasmic reticulum wrapping around mitochondria causing mitochondrial fission. M, mitochondria. Proximal tubules are highly susceptible to ischemic injury, with rapid loss of brush border and cell detachment.25,26 However, tubular cells can regenerate, and brush borders are intact 9 months after acute ischemia (Figure 9A). Unlike the elongated mitochondria found in normal proximal tubules, post-ischemic proximal tubule mitochondria are small and highly disorganized, and there is an abundance of lysosomes (Figure 9B). There is also evidence of mitophagy, with early and complete autophagosomes around mitochondria (Figure 9, C and D). Some autophagolysosomes contain cytoplasmic content or are completely homogenized (Figure 9, E and F). Autophagy was not observed in proximal tubules treated with SS-31. Mitophagy in proximal tubules after acute ischemia. Rats were treated with SS-31 (2 mg/kg per day) or saline for 1.5 months starting 1 month after acute ischemia. Proximal tubules were examined by transmission electron microscopy. (A and B) Representative images obtained 9 months after acute ischemia showing normal brush border (BB). Mitochondria are small and highly disorganized, and there is an abundance of lysosomes (L). (C and D) Representative images showing early and complete autophagic vesicles (AV) surrounding mitochondria (M). (E and F) Representative images showing autophagic vacuoles containing mitochondria and other cytoplasmic content. In addition to mitophagy, some proximal tubule mitochondria appear relatively normal but have membrane vesicles in close apposition to the OMM (Figure 10, A–D). These vesicles may be dilated ER that are in close apposition to the OMM, commonly termed mitochondria-associated membranes. These structures were not seen in rats that received SS-31 treatment (Figure 10, E and F). Mitochondria-associated membranes in proximal tubules after ischemia. Rats were treated with SS-31 (2 mg/kg per day) or saline for 1.5 months starting 1 month after acute ischemia. Proximal tubules were examined by transmission electron microscopy 9 months after ischemia. 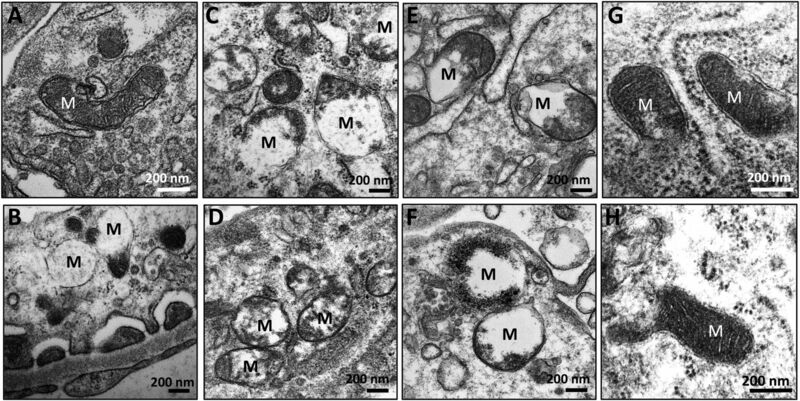 (A–D) Representative images showing membrane vesicles in close apposition to the OMM. (E and F) Representative images from SS-31-treated samples did not show these mitochondria-associated membranes. Our results suggest that persistent mitochondrial damage underlies the progression of CKD, and this was confirmed with the mitoprotective agent SS-31. Treatment with SS-31 before ischemia protected endothelial and epithelial mitochondria, preserved peritubular and glomerular capillaries, and prevented inflammation and fibrosis.29 Here we show that SS-31, started 1 month after ischemia, can repair mitochondria in endothelial cells, podocytes, and tubular cells. This led to restoration of peritubular and glomerular capillaries, preservation of podocyte architecture, suppression of inflammation, and fibrosis. SS-31 abolished the increase in TNF-α and TGF-β over the 6-week treatment interval. Remarkably, renal protection persisted for at least 6 months after termination of SS-31 treatment. No other experimental treatment has been shown to accomplish this when given so late after AKI. Most experimental treatments evaluated in animal studies are given prior to or shortly after acute injury, although the clinical reality is that most patients present with established disease. SS-31 protects mitochondrial structure by interacting with cardiolipin on the inner mitochondrial membrane and protecting cristae structure.26,47,48 Cardiolipin promotes membrane folding and promotes respiratory complexes to form supercomplexes to facilitate electron transfer, promote ATP synthesis, and reduce electron leak. Dysfunctional mitochondria generate ROS, and cardiolipin is particularly susceptible to lipid peroxidation. In the presence of ROS, cytochrome c acts as a peroxidase and causes cardiolipin peroxidation and cristae degradation. SS-31 acts as a multifunctional antioxidant by minimizing electron leak, scavenging excess electrons, and inhibiting cytochrome c peroxidase activity.28,47,49 SS-31 has been reported to restore cardiolipin content and mitochondrial cristae structure, and improve mitochondrial energetics, in experimental models of chronic kidney and heart failure.50–52 The recovery of podocyte bioenergetics allowed repair of the actin cytoskeleton and podocyte structure. SS-31 protects mitochondrial integrity and prevents inflammasome activation and upregulation of IL-18 and IL-1β. Ischemia causes mitochondria damage resulting in decreased ATP production, increased ROS production, and cardiolipin peroxidation. Damage to mitochondrial membranes leads to the release of mitochondrial DNA (mt DNA), mitochondrial reactive oxygen species (mt ROS), and cardiolipin that are known to activate the NLRP3 inflammasome. The NLRP3 inflammasome, together with the adaptor protein (ASC), triggers activation of caspase-1 (Casp1), which then processes the proinflammatory cytokines pro–IL-1β and pro–IL-18 into their bioactive mature forms (IL-1β and IL-18). SS-31 (blue dots) targets cardiolipin, inhibits cardiolipin peroxidation, and protects mitochondrial cristae membrane.26 By preserving mitochondrial integrity, SS-31 not only preserves ATP production but also prevents NLRP3 inflammasome activation and normalizes IL-18 and IL-1β expression. ASC, Apoptosis-associated speck-like protein containing a caspase-recruitment domain. Several inhibitors of IL-1β and IL-18 are in clinical development, as well as inhibitors of the NLRP3 inflammasome and caspase-1.58,59 Targeting upstream of the inflammasome might prove more effective than single anticytokine therapies and carry less risk. SS-31 has been shown to be highly effective in preventing acute and chronic kidney injury, including ischemia-reperfusion injury, UUO, contrast dye, endotoxemia, and streptozotocin-induced diabetic kidney injury.25,29,55,60–62 SS-31 has also been reported to reverse progressive CKD after chronic ischemia caused by renovascular stenosis, and reduce glomerulopathy and tubular injury caused by high-fat diet.63,64 SS-31 (also known as MTP-131, elamipretide, and Bendavia) may represent a novel treatment for CKD in addition to BP control. The study was performed using male Sprague–Dawley rats (Charles River Laboratories, Wilmington, MA) weighing 250–300 g. Animals were housed in 12:12-hour light/dark cycle and allowed free access to water and standard rat chow. Care of the rats before and during the experimental procedures was conducted in accordance with the policies of the National Institutes of Health Guidelines for the Care and Use of Laboratory Animals. All protocols had received prior approval from the Weill Cornell Medical College Institutional Animal Care and Use Committee. SS-31 was supplied by Stealth Peptides Inc., Newton Centre, MA. Unless otherwise specified, reagents and assay kits were purchased from Sigma-Aldrich (St. Louis, MO). Rats were anesthetized with ketamine/xylazine and bilateral renal ischemia was induced by application of nontraumatic microvascular clamps around both left and right renal pedicles for 45 minutes, as previously described in detail.25 After ischemia, the animals were allowed to recover for 1 month. Surviving rats were randomly assigned to 6 weeks of treatment with SS-31 (2.0 mg/kg per day) or saline by subcutaneously implanted osmotic pump (Alza, Cupertino, CA). Rats were euthanized either immediately after drug treatment or 6 months after termination of drug treatment. Kidneys were harvested for biochemical and histologic analysis. Kidney tissues were frozen at −80°C for Western blotting or embedded in OCT-cryostat sectioning medium containing 30% sucrose for immunohistochemistry. Other samples were fixed in 4% paraformaldehyde for paraffin sections and ultrastructural examination by transmission electron microscopy or HIM. Paraffin sections (3 μm) were stained with periodic acid–Schiff and examined by light microscopy (Nikon Eclipse TE2000-U). Masson trichrome staining was used to assess interstitial fibrosis and glomerulosclerosis. Microvascular density and endothelial injury were assessed by immunohistochemical staining of CD31 and vWF, respectively. Frozen OCT blocks were cut into 8 μm sections, fixed in acetone for 4–5 minutes at room temperature, and incubated with anti-mouse CD31 (BD Biosciences, San Jose, CA) and anti-rabbit vWF (Sigma-Aldrich) overnight at 4°C. Sections were then incubated with anti-mouse IgG-conjugated Alexa Fluor-488 (Invitrogen, Carlsbad, CA) or goat anti-rabbit IgG-conjugated with biotin (Vector Laboratories, Burlingame, CA), and then treated with streptavidin-conjugated Alexa Fluor-594 (Invitrogen) for 30 minutes at room temperature, covered with VECTASHIELD Mounting Medium with DAPI (Vector Laboratories), and imaged by fluorescence microscopy (Nikon Eclipse TE2000-U). For each animal, ten representative glomeruli were selected in the renal cortex, and the green fluorescence intensity of the CD31 immunostain was quantified (ImageJ; National Institutes of Health) and averaged. Similarly, ten representative areas of the inner stripe of the outer medullar were quantified and averaged. Macrophages were assessed by immunohistochemical staining of 4 μm paraffin sections for CD68. The kidney sections were incubated with anti-mouse CD68 (Abcam, Inc., Cambridge, MA) overnight at 4°C and incubated with HRP-conjugated anti-mouse IgG (Dako, Carpinteria, CA) for 30 minutes at room temperature, and color developed by DAB substrate kit (Vector Laboratories). The number of CD68+ cells were counted from five different fields for each sample and averaged. The cytokines TNF-α, TGF-β1, IL-18 and IL-1β were quantified by Western blotting. Kidney homogenates were prepared according to standard protocol (Santa Cruz Biotechnology, Santa Cruz, CA), suspended in loading buffer, and subjected to 4%–15% SDS-PAGE. The resolved proteins were transferred to an Immuno-Blot polyvinylidene difluoride membrane (Bio-Rad, Hercules, CA). After electroblotting, the membrane was incubated overnight with primary antibodies against TNF-α (αβ1793; Abcam, Inc.), TGB-β (sc-146; Santa Cruz Biotechnology), IL-18 (MAB521; R&D Systems, Minneapolis, MN), and IL-1β (MB5011; R&D Systems). Membranes were further incubated for 1 hour with HRP-conjugated secondary antibodies (Dako). Protein bands were detected with an enhanced chemiluminescence detection system (Bio-Rad) and autoradiography. Bands were evaluated for integrated density values on Image Lab Software (Bio-Rad). Pieces of renal tissue were fixed in 4% paraformaldehyde, postfixed in 1% osmium tetroxide, dehydrated in graded alcohols, and embedded in Epon. Ultrathin sections (200–400 Å) were cut on nickel grids, stained with uranyl acetate and lead citrate, and examined using a digital electron microscope (JEM-1400; JEOL Ltd.). Kidney tissues were sectioned at 500 μm on a Leica vibrating microtome. The slices were cut into smaller, wedge-shaped pieces so that they would remain flat during the drying process. Tissues were dehydrated through a graded PBS-MeOH series at 4°C, according to previously published methods.35 Tissues were subjected to critical point drying with CO2. Dried samples were mounted on scanning electron microscope stubs using carbon sticky tabs and stored in a desiccator until imaging. HIM was carried out on the Carl Zeiss Orion Plus helium ion microscope (Carl Zeiss GmbH, Jena, Germany) operating at 30 KeV acceleration voltage, with a beam current of approximately 0.5 pA. A 10 nm layer of Au was evaporated on the samples to minimize local charging effects. For all images taken, an electron flood gun was used for charge neutralization at an accelerating voltage of 900 eV. The vacuum reading in the analysis chamber was 2×10−7 torr. Results are expressed as means±SEM. Statistical analysis was carried out using Prism software (GraphPad Software Inc., San Diego, CA). Multiple group comparisons were performed using ANOVA followed by a Tukey post hoc test. A P value <0.05 was considered statistically significant. The SS peptide described in this article has been licensed for commercial research and development to Stealth Peptides Inc. (now Stealth BioTherapeutics, Newton, MA), a clinical stage biopharmaceutical company, in which H.H.S. and the Cornell Research Foundation have financial interests. H.H.S. is the inventor of SS-31 and the Scientific Founder of Stealth BioTherapeutics. We thank Juan Pablo Jimenez of the Electron Microscopy & Histology Core Facility at Weill Cornell Medical College for his technical assistance. This work was supported, in part, by the Research Program in Mitochondrial Therapeutics at Weill Cornell Medicine. S.L. and Y.S. acknowledge support from the Social Profit Network. L.C.F., T.G., and V.M. acknowledge support from National Science Foundation grant Division of Materials Research 1126468. V.M. was also supported by a Graduate Assistance in Areas of National Need fellowship. See related editorial, “Preventing the Progression of AKI to CKD: The Role of Mitochondria,” on pages 1327–1329. This article contains supplemental material online at http://jasn.asnjournals.org/lookup/suppl/doi:10.1681/ASN.2016070761/-/DCSupplemental.